For children age 3 through grade 5, we offer programs that build faith in the knowledge of God and the fellowship of God’s community. We offer an exciting, interactive Sunday School program along with mid-week enrichment activities. We believe the primary goal of Sunday School is to raise children in the knowledge of God and fellowship of God’s community. Faith needs Scripture to help it grow, because there is no comprehension and meaning without content. At the Presbyterian Church of Basking Ridge, the Bible lies at the heart of all our programming. Children (age 3-grade 5) begin in worship in the Sanctuary with their families. After the Message for Children, children are invited to attend our Sunday School. They will move to the chapel as a group for a Bible story, hymns, and a prayer. Then they will be separated into groups by grade for the morning’s lesson. A variety of learning techniques help children learn about their faith while having an enjoyable experience incorporating games, music and art. Parents may meet their children in Westminster Hall after the worship service. To learn more about Sunday School, contact Director of Children & Family Ministries, Stacy Currie, 908-766-1616 x14. Our Children’s Midweek Ministry, for children ages 3 through grade 5, happens on Tuesdays from 4:15 – 5:30 PM, in Westminster Hall. It includes a full hour and 15 minute experience for all children in this entire age range. Each Tuesday afternoon will include a Bible lesson, fellowship, fun, crafts, snacks and music. Your children will not want to miss it! We encourage you to invite your friends and neighbors to participate. Parents are welcome to either stay or drop their children off. Please contact Stacy Currie or Beth Donley with any questions. 4:15-4:45 Little Voices Choir – enables young children to explore music, biblical texts and movement through activities based on Christian songs, hymns, musical games and stories. 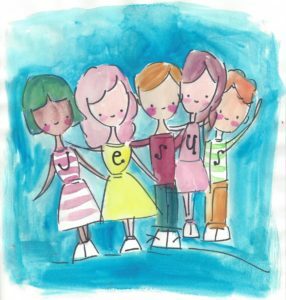 4:45-5:30 Joyful Noise Choir – increases children’s enjoyment of Christian music and encourages a lifelong appreciation for music. The nursery, located near the Sanctuary, is open on Sunday mornings during the 9:00 a.m. and 10:15 a.m. worship services for children age 2 years and younger. The church has a minimum of two caregivers in the nursery at all times. Because we want your worship experience to be as comfortable as possible, a silent paging system is available which ensures our ability to reach you at any time. The nursery features a diaper changing station and sink, and also serves as a private feeding room. Newcomers are always welcome. If you have any questions about the nursery, contact Stacy Currie. Vacation Bible School will be August 12–16 this year, from 9 am – 12 noon, Monday – Friday. Check back for cost and registration information. Don’t miss games, crafts, music, dancing! Come learn about God’s amazing love for you! Spread the word to your family, friends, and neighbors! Would you like to help out during VBS? To share your time and talents, please contact Director of Children & Family Ministries, Stacy Currie. We need YOU, no matter your talents, skills, or particular availability! Childcare will be available for younger children of volunteers. Founded in 1982 by the Education Council of the Basking Ridge Presbyterian Church, the Tree House serves the community by offering loving full-day and half-day child care programs for children ages 2 to 5. As a mission of The Presbyterian Church of Basking Ridge, The Tree House strives to provide an environment rich in independent learning, while fostering character development, confidence, and a love of learning in every child. At The Tree House, children build their foundation for future learning by exploring their potential and the world in which they live. To learn more about the Tree House or to schedule a tour, contact the Tree House Director, Jen Nowack, or visit the website.